Thanks to PlayStation for hosting the trailer for this game! I’m obsessed with adding all the games I’ve ever wanted onto my wishlist on psprices.com. The other day I was trying to remember two other games I really wanted to play on the PS4 and one of them was modern takes on Chrono Trigger. That game turned out to be I Am Setsuna, which is still roughly a $40 game. 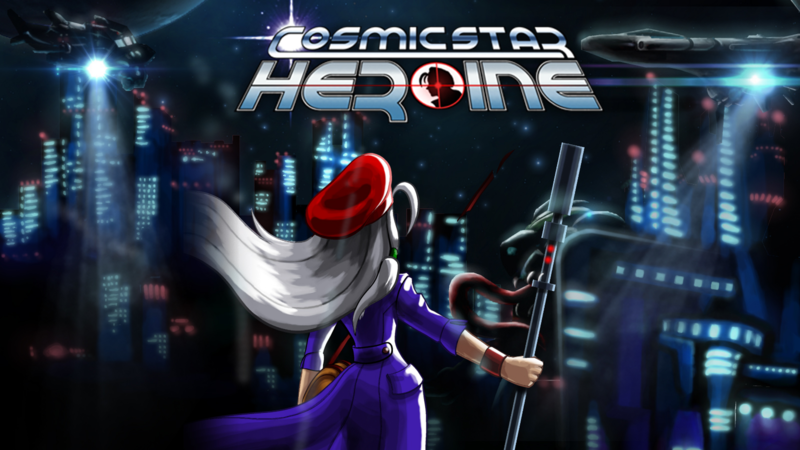 As I was looking for that title, I kept seeing people recommend Cosmic Star Heroine. Setsuna gets the emotional weight of Chrono Trigger but Cosmic Star Heroine picks up the game mechanics and such from Chrono Trigger and Phantasy Star. Which I’ve heard of Phantasy Star but never played it but I was tempted by the Chrono Trigger inspiration. So I am Setsuna was still an expensive game but when I looked up Cosmic Star Heroine, it was only three dollars! Down from $15. Which I’m in a real, buy any three dollar game I come across. Which I did end up buying Atomic Ninjas for the Vita, as it was also $2.99, it will be a game I can never play but at least I have that peace of mind that I’m getting those six games I foolishly missed out on, so that’s nice. Cosmic Star Heroine was only three dollars, but I still didn’t want to buy a game I would later regret purchasing. I read several subreddit threads regarding the game and those who loved it, love it (naturally), and those who didn’t like it, didn’t stick with it or liked Chrono Trigger so much that this game was a pale imitation of the older game. So I wasn’t sure so I kept reading more reviews. I kept reading about how complicated the battle mechanic is. There are moves you can only use once, and once those moves are all used, you have to take a rest action and that restores those moves. Each character gets at least one move which they can keep using, but it is a weaker move. I read how fun the game can be. So I reached out to someone who I know loves JRPGs, and that was Rob of PlayStation Access. @rob_pearson86 ever play Cosmic Star Heroine? It is only $3 in the store but I'm reading mixed reviews. I need something to fill the #ChronoTrigger shaped hole in my heart. Thank you! The game looks amazing and the more I've been reading about it makes me want to play it. I'll buy it tonight. I was not expecting Robert Boyd to respond to my tweet! Cosmic Star Heroine is created by Zeboyd Games, a two man game creating team. The other man is Bill Stiernberg and they made Cthulhu Saves the World and two Penny Arcade games. So he reach out, which I feel bad I didn’t hashtag his game like I hashtagged Chrono Trigger. I have to live with that. I bought it, couldn’t play it for a night and then was able to get to the two hour mark. I did the opening sequence, got to our spaceship, went to the first planet, Rhomu, and now have returned to the spaceship. I have the main character, Alyssa, her buddy, Chahn, and our tech guy, Dave. They really have the best guides. So all of those missable trophies bum me out as I’m trying to make sure I don’t look at it too much but I also don’t want to miss a trophy either. Reading the guide’s introduction, I found out there isn’t any post game stuff, so that’s pretty disappointing too. So everything has to be done before the final battle as there is no free roam. At least the game tells you to make a backup file so that’s nice. The game’s hints are very funny and really adds to the overall impression. The game is roughly 15 hours and that seems to be at the game’s longest. I’m also not playing on the hardest mode but the second one, which seems to be Normal (Heroine) and I’m liking it. Hard mode is Super Spy and then there is the hardest mode. There is a trophy for doing the first fight on the highest difficulty but the game is nice enough to make it so you can change that setting at any time so I went from the highest of four to the second one, which feels like Normal. There are not any other trophies that involve beating the game on any particular difficulty. Overall, I’ve been enjoying my short time with the game, I do feel the itch to get back to my other games those games are not going anywhere at the moment. I feel pretty satisfied with my time with Peggle 2, I got all of the trophies I figure I was going to get. I attempted some more additional trials but those trophies are an all or nothing situation. I was hoping to get the trophy of beating a level with more than 12 balls but it is complicated to even get that to work much less at the very beginning of the level. I can do it in a trial but the game doesn’t count trails or multiplayer. I have the game so I can go back and play it whenever I would like. Which I might just make it a game I chill with after a session. I like how it doesn’t take long at all to load before I can start playing. Unlike Lego Movie 2 that has a ridiculous (a word I can never spell on my own), that has a two minute loading sequence, you have to press X to continue the game, press X to accept the notification to not turn off the game when you see Unikitty’s face, and all of that lead another two minute loading sequence as we see Emmet falling into whatever level you want. So before you turn off the game, make sure you are in the world you want to be. A couple times, we will land and realized we were done and had to jump to another planet and another two minute sequence. It just adds up and it kills my buzz when I think about starting the game after playing another one. There is a total of four X presses but I can’t think of what the other two are. X to continue, maybe another X to confirm the save file (of which is there is only one), Unikitty’s face and not to turn off the system, and maybe just another X to confirm we’ve read the message? Which, we are on our final planet, the Classic Bricksburg from Movie 1, we just started it. We got Movie 1 Lucy so we officially have all of the characters. We just have to get the 25 purple bricks of the world, some are behind quests and others are just floating about. From there, we have to finish the Syspocalypsestar planet, which should be fun to build 20 buildings and do all of those quests. I’m curious to see what it all looks like as we’ll be putting the buildings down ourselves so everyone’s Syspoclypsestar should look different. We’ve just been so busy that we haven’t had a chance to play in a couple nights. I’m excited to find out what the free games in April 2019 are going to be through the PS Plus! We’re getting close to the end of the month!